Way back when Older Daughter was about a year old, and even though our finances were very, very tight, we bit the bullet and brought a brand-new bread machine. 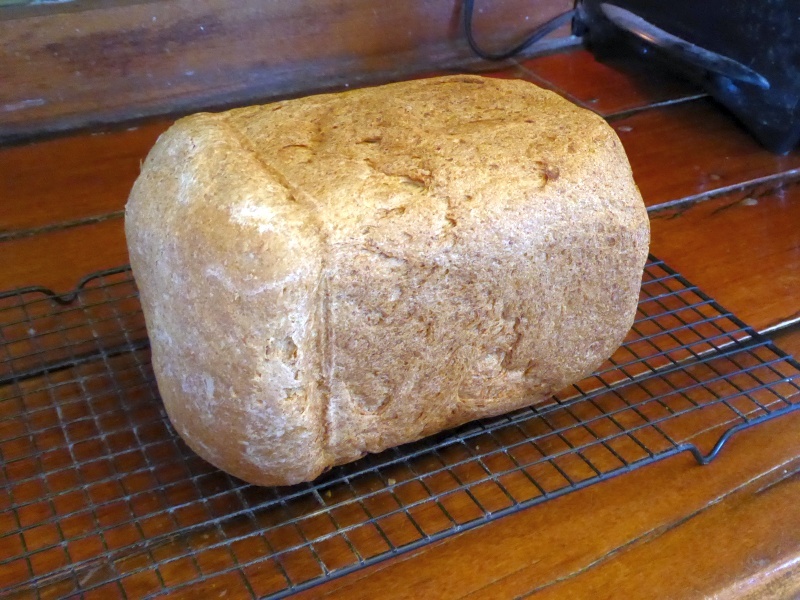 Don loves sandwiches and eats a lot of bread, but my breadmaking skills have always been marginal, so a bread machine seemed like the perfect answer. We did our research and purchased what was, at the time, a top-of-the-line model: The Regal Kitchen Pro. As I recall, it cost somewhere on the order of $180. That was a tremendous amount of money for a penniless young couple with a new baby and a startup woodcraft business, but we did it. And oh my, what a machine it's been. That breadmaker has turned out hundreds upon hundreds of perfect loaves over the past 20 years. Let's see, if I make an average of three loaves a week, times 52 weeks/year, times 20 years, that amounts of about 3,120 loaves of bread. In other words, the ingredients were there, but nothing happened. We fiddled with the wall plug, thinking perhaps it needed to be reset. Then Don fiddled with the machine, wondering if a wire came loose. But no, it appears after 20 years of faithful service, my beloved bread machine has finally bit the dust. But wait! It just so happened Don had found an identical model a couple years ago at a thrift store, in excellent condition (in fact, it looked like it had never been used). At only $15, he snatched it up. As it turned out, shortly thereafter the bucket on my old machine sprang a leak, so I just transitioned to the new bucket from the thrift-store machine. This morning I hauled the thrift-store machine out, dusted it off, slipped in the bucket with last night's ingredients, and less than four hours later a beautiful loaf came out. I tell ya, folks, a bread machine -- if you actually use it -- is one of the handiest and most reliable of household appliances. I hate to see my faithful old machine go, but at least I have a new (to us) replacement which, I hope, will last for the next 20 years. I use the "2" setting ("Large-dark") on my machine. ANOTHER UPDATE: This post got mentioned on SurvivalBlog! We went through two of those machines of goodness. I sure do miss them. 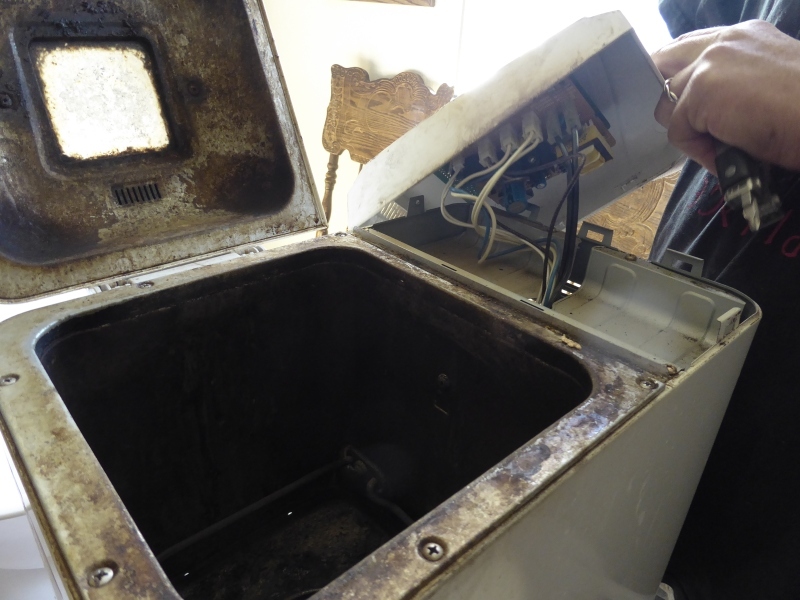 20 years is pretty good for an appliance with that level of physical use. When I bought mine it was $40 and then when it went on sale I bought another and put it in storage. You’ve inspired me to look for an affordable bread machine. With 3 kids and a husband who loves bread I think we would get a lot of use out of it. I can’t believe your machine lasted 20 years! I just bought a used pan and paddle for my 20 year old Sunbeam a few days ago. For several years the seal at the bottom has leaked, butI got around that by putting a half cup of flour in the bottom first, before the liquid. Hopefully it will last a few more years to make the pan a worthwhile purchase. I think thrift stores are the way to go for bread machines, probably not 1 in 100 people that get one actually use it regularly, once the novelty wears off. Patrice has made me kinda want a bread machine. Don't toss the old one yet. Plenty of spare parts in there. I've kept mine running all these years with spares from thrift stores and yard sales. Once you're so practiced and successful with a particular machine it is awfully hard to switch to today's less durable versions. 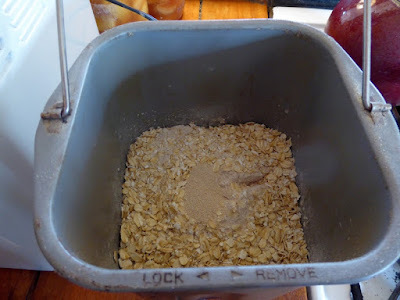 Not as easy as a bread machine I suppose, but I make all of our bread in a food processor. Up to the point where I put it in a bowl to rise--then a loaf pan. There's no need to fiddle with "proofing" yeast. Technology definitely has merit! I purchased one about a year ago. I was having problems with 50% newley ground wheat collapsing after a nice rise. Someone, on one of the Morman forums, suggested adding a teaspoon of ascorbic acid (Fruit fresh) and that solved the problem! My parents are still using and loving the toaster they got for a wedding present 62 years ago. It is so much better than anything we can get today. I very much miss my bread machine, although I am able to make homemade bread, when I had the machine it made the process so much easier to mix the dough up in it and then choose to bake in the machine or in the oven. I look forward to my next machine. We had a Panasonic for years - when they first became popular - and when that one died after years of use, we bought a Zojirushi. We have used ours forever. 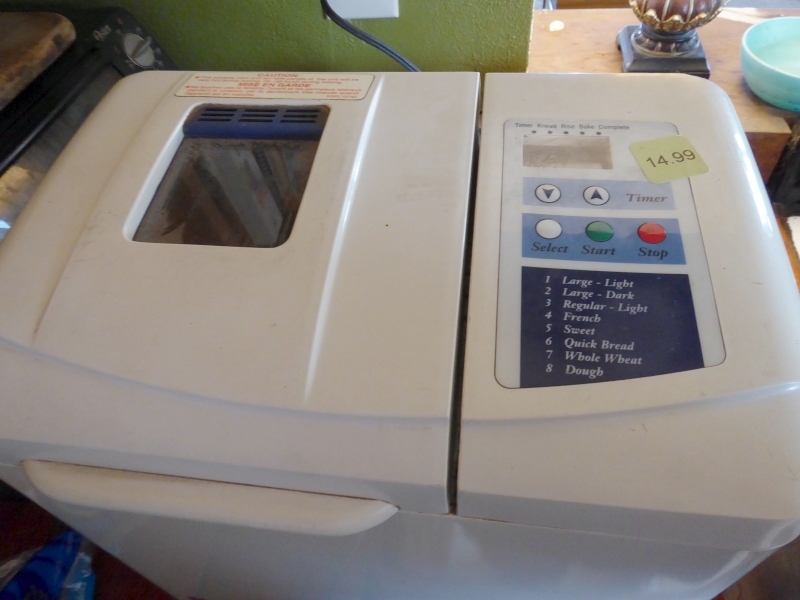 We, too, found an almost new breadmaker (Zojirushi) at one of our thrift stores. It was about $15 as well! 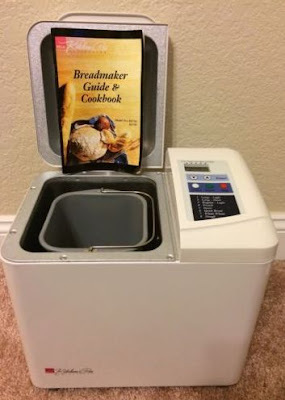 We are still using our first one, but like you, we have the thrift store breadmaker sitting on a storage shelf for when the sad day of demise comes to our original. Why would people give perfectly good breadmakers away? Store bread is thin, mushy, and expensive! I'm one of those people that prefer to mix and knead the dough myself, let it rise until my eyeballs decide it's ready, punch it down, let it rest, shape it, let it rise again. I *think* it is because I instantly get transported back to my Grandma's kitchen when I was a little girl, my favorite place in the world. It was *not* my mother's favorite place; she and her mother never got along. To this day, bless her heart, she can't can't bake yeast bread worth a flip. She doesn't even use White Lily flour for her biscuits. I bought her a breadmaker, and she was so ecstatic with it that she bought one for me! It languishes on a shelf, unused and unloved. But her fried chicken is so much better than mine that I hang my head in shame. I have a temperature-controlled deep fryer; she has a cast iron chicken fryer on a burner. Guess it's a good thing we all have different talents. If the paddle does not spin, check the drive belt. It may be broken or some of the teeth stripped off. Replacement belts are available. Well now that he's and EX, I'm getting out my machine!! :) !! I always see at least two bread machines at Goodwill when I'm there looking around. Always under $10 and appear unused. I love to work with yeast dough by hand too...but for one person...eh. I still have my Hitachi bread machine from the early 90's. Haven't given it the amount of use you have, but I stopped counting loaves at 926 and that was about 10 years ago. That and my Instant Pot electric pressure cooker are the two appliances I would not be without. My little work horse of a bread machine is chugging away on the counter as we speak. It belonged to my late mother in law and came to me on her passing. I have been using it for 10 years and have no idea how long she used it. While I don't make 3 loaves a week, I usually make at least one along with dough for pizza. The quality can't be beat, not to mention I am suspicious of things from the store that look the same 3 weeks later as they did initially! Could we get your recipe please? I have a nearly new Oster machine but I could build walls from its product so far. Could I get your recipe? My machine is a nearly new Oster but I am turning out bricks literally. Thanks. I just now put the recipe in the body of the post near the bottom. Thanks for the reminder.